Deane Public Works Ltd is a very successful family run Private Limited Company with a reputation for excellence in Civil Engineering Construction and Property Development. Founded in 1967 by George and Liz Deane, Deane Public Works Ltd was formed initially to service the plant hire sector of the construction market. From these small beginnings, the company has evolved into a multi-disciplined business carrying out a diverse range of Civil Engineering contracts from roads and bridges to utilities and marine contracts etc. The Company, which has its headquarters at the very scenic, Killadeas, Irvinestown, Co. Fermanagh overlooking Lough Erne, is celebrating 50 years in business in the construction industry in 2017 and have successfully delivered many high-profile projects for private and public sector clients during this time. Deane Public Works has a long standing and highly skilled direct labour workforce exceeding over 50 staff with many employed by the company for more than 25 years and they have been essential in the development of the company. As an Investors in People Company the Directors are committed to the principle of continuous employee development. Through a structured training programme, that includes all employees, the company seeks growth through knowledge and the efficient use of this vital resource. “Deane Public Works is an excellent example of how investing in training can help business performance,”remarked Managing Director George Deane. Deane Public Works' professional management team has a combined experience in excess of 200 years and have overseen many key infrastructure projects throughout Ireland over the past 50 years offering a professional approach at all times. Managing Director, George prides himself on a 'hands on' approach to the business, and leads by example from the highest management levels to site operations, never afraid to deploy his expertise and drive machinery when necessary. Deane Public Works Ltd act as principal contractor on Contracts. However, they also have extensive experience of working with companies in joint ventures and consortiums to deliver key contracts. The company has key strategic alliances and partnerships in place for tender bids that require specialist expertise including: M&E/Process, Remediation & Environmental, Structural Steelwork, Asbestos Removal etc. They have the experience, expertise, management skills, resources, technical knowledge, and processes required to successfully manage contracts and can provide best value for money competitive tenders for contracts. Other Specialist works include: concrete repair, waterproofing to structures / buildings, natural stone construction, reinforced earth structures, directional drilling / trenchless technologies, pipe jacking & tunnel boring, soil nailing & rock anchors and guniting & grouting. The Deane family run company currently hold the following accreditations and memberships: Health and Safety Management System to Safe-T-Cert (Grade A), Quality Management System to ISO 9001, Environmental Management System to ISO 14001, NIEA Licensed Waste Broker and Waste Management Carrier (Registered and fully NIEA Licensed Waste Facility), Constructionline, Construction Employers Federation, Investors in People Award, Construction Industry Training Board, Federation of Small Businesses, NHBC Registered Developer, British Safety Council, Considerate Constructors Scheme and Institution of Civil Engineers Approved Graduate Training Scheme. Their depots are sited province wide, with a vast range of specialist owned plant/equipment and materials to offer material purchase cost savings to their clients. Their vast array of key plant and machinery comprises JCB JS260, Movax Sheet Piling Hammer, JS200, JCB8085, Hitachi 130, 2 CASE CX180, CASE CX210, Liebherr 914, Hitachi 27, Case Rubber Duck, DAF 106 Double drive tractor unit, VOLVO FM12 double drive tractor unit, FM12 Hookloader, Scania 8 wheel tipper, New Faymonville MAX 4 axle extendible lowloader and a Dennison sliding tipping trailer. The Fermanagh based company operate predominantly in the public, new work and productive infrastructure sector of the market throughout Ireland. Their main client categories include: Central Procurement Directorate, Northern Ireland Water, Irish Water, Roads Service, National Roads Authority, Department of Agricultural & Rural Development, Department of Education NI, Department of Social Development, Rivers Agency, Waterways Ireland, Loughs Agency, NI Fisheries and Harbour Authority, Western Education and Library Board, ILEX Urban Regeneration Company, InvestNI, IDA Ireland, Department of Finance & Personnel, Fermanagh District Council, Omagh District Council, Strabane District Council, Donegal County Council, Cavan County Council, Leitrim County Council, Monaghan County Council, Sligo County Council, Longford County Council, Roscommon County Council, Craigavon Borough Council, Cookstown District Council, Letterkenny Town Council, Antrim Borough Council, Armagh City and District Council, Belfast City Council, Derry City Council, Coleraine Borough Council, Down District Council, Dungannon and South Tyrone Borough Council, Lisburn City Council, Magherafelt District Council and Newry and Mourne District Council. Lough Rinn International Rowing Course Phase I & IIA, Co. Leitrim; Omagh Throughpass; Newry Middlebank Canal Structural Repairs; Newry Cathedral Corridor Public Realm; Devenish College Enabling Works; Lisanelly Main Campus Demolition; Dunsinaire Flood Alleviation Works; Maze Remediation Phase 2; Ballyconnell Footbridge; Tydavnet Group Water Supply; Rathfriland WwTW; Irvinestown WWTW; Mosstown Road and Bridge Realignment, Co. Longford; Portora Sluice Gates Replacement, Enniskillen; Letterkenny Environmental Improvement Scheme; Lough Key Boardwalk, Roscommon; Eske River Bridge, Donegal; Bunagee Marine Development; Urban Regeneration Works at Fort George Barracks; Strabane Bypass; Aghalane Bridge; Lough Swilly Slipways; Buncrana Pier Improvements; Ballyronan Marina & Caravan Park; Kinnego Marina, Demolition of Foyle College; Silverhill Manor, Devenish Manor and Old Rossorry Drive. Turning attention to the future, 2017 is going to be a very busy year for the company as they have been appointed to a number of large water and wastewater frameworks throughout Ireland. In addition, they are currently progressing work on a number of key projects and have a number of other projects to commence in the coming months. Deane Public Works Ltd has developed a niche in the market and invested heavily in direct specialist squads and Movax plant specifically for sheet and structural piling and have reaped the benefits of this over the past few years. Our Piling Squads and expertise have added real value to many of our projects and have been in high demand by Clients. The company is well placed for future growth, building on previous successes, and keen to consolidate in existing markets whilst further developing the company through opportunities in new markets. The operational strength of Deane Public Works lies in the utilisation of skills across a broad range of working disciplines, to make projects come alive. They strive to achieve construction excellence by delivering projects to budget, on time, defect free and exceed expectation but never at the expense of quality and craftmanship. They are firmly committed to working in partnership with all clients and operate a ‘can do’attitude in all their operations. Deane Public Works strive at all times to deliver the optimum return for both clients and themselves in a spirit of mutual respect and understanding through collaborative working. The core company values are Quality Product, Professional / Personal Service, Value for Money, Construction Time Predictability, Innovation / Value Engineering and Construction Excellence. There also is an ancillary group of companies associated with the firm including: Deane Developments, Deane Concrete, Deane Autoplant and Deane Hospitality. Deane Public Works Ltd has been supplying readymix concrete product range for almost ten years. Their Concrete production facility was introduced to meet the high demand within the local and surrounding areas and border counties. Supply of their readymix product range has proved very popular with local companies due to the very competitive prices on offer. Using the state of the art Xact Volumetric concrete mixing system, a high-quality product is on offer to customers and the system is designed to enable the company to produce concrete ‘On the Go’. 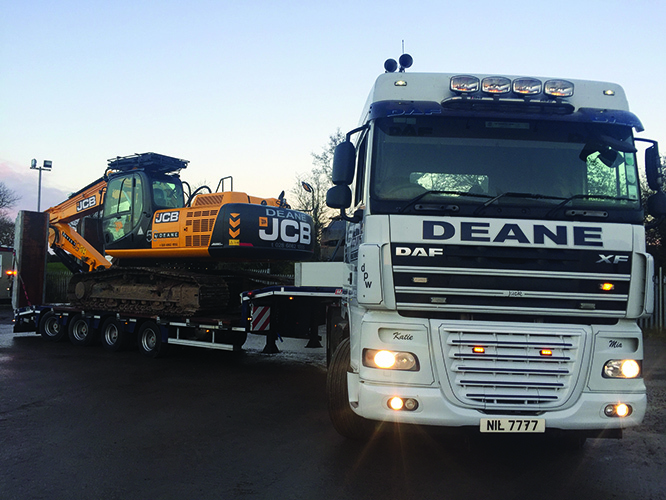 Deane Public Works Ltd operate two long established quarries in the Enniskillen area producing and supplying high specification aggregate, ensuring their range of quality products is available to their customers. They can provide a full range of unbound granular material, excavated and processed into various grades. They also have two fully licensed and registered NIEA Waste facilities in N. Ireland for waste disposal. Deane Public Works Ltd have been the recipients of some prestigious Industry Awards over the years, below are some of these awards: CEFNI Construction Excellence Awards (Health & Safety Award 2014), CEFNI Construction Excellence Awards (Health & Safety Award 2006), CEFNI Construction Excellence Awards Civil Engineering Project of the Year (Portglenone WwTW), Irish Concrete Society Award (Eske River Bridge), Brownfield Briefing Awards 2012 (Maze / Long Kesh Remediation Phase II), NHBC Pride in the Job Awards in 2009 (Devenish Manor), NHBC Pride in the Job Award 2010 (Devenish Manor) and Investors in People Award. In addition, Deane Public Works Ltd has been shortlisted in several categories for the Construction Excellence Awards which are organised and adjudicated by the Construction Employers Federation.